I was very excited to get into this concert from a waiting list. The concert was a slated to be Bach in the first half, Mendelssohn concerto in the second half. When Joshua Bell took the stage, however, he explained that upon his discovery of an accompanist, he would be altering the Bach-heavy program ("Nothing against Bach, or anything"). He then said that the piano wasn't in the same spot that it was earlier and he and the pianist proceded to move the piano with one hand and his $4 million Strad in the other! Bell opened the concert with Praeludium and Allegro by Kreisler. The most immediately striking aspect of Bell's performance was his stage presence. He also moves a lot, but I think that helps him as far as musical expression. For the audience, his movement makes him more interesting to watch. He then played two Tchaikovsky pieces, Meditation and Melodie. He ended the first half with Sarasate's Introduction and Tarantella, which is - of course - incredibly virtuosic. After the intermission, the orchestra played one piece without a soloist and then Bell joined them to play the Mendelssohn concerto in full. It was quite a moving performance. The way he commanded the orchestra was astounding in itself! When he wasn't playing, he would turn and look at the orchestra and sometimes even lean into the other sections, which would make me nervous if I were in the orchestra. The audience would not stop applauding. As an encore, Bell played an excerpt from "The Red Violin," which was also phenomenal. It started out slow and sad and then progressed in quickness and technicality. The icing on the cake was after the concert. 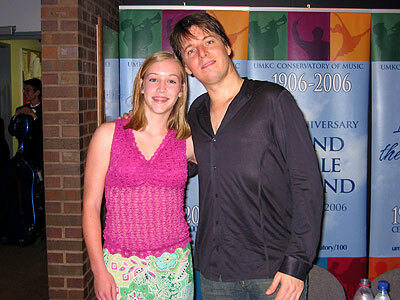 I waited in line with my dad to meet Joshua Bell. I talked to him briefly, congratulating him on the concert of course. He signed my program and then I got my picture taken with him. Just kidding, I'm happy for you! That sounds like an all-around great experience. The two of you look good in the photo, too. Josh must have been sweaty and tired and still he took time for his audience and fans. He's "real people". You do look like a happy girl!! YAY for you! I'm so glad you got to hear him play! Hey, Sydney, I was at that concert too!! I'm a huge JB fan so I timed my annual visit to my parents (who live in Manhattan, KS) so I could see him. It was wonderful, wasn't it?